When this slim paperback was published, books on fly fishing for pike were as rare as rocking horse dung. In fact, there were only two that I was aware of, and Alan Hanna's book was the only one written about catching pike in Europe, which made it pretty exceptional to start with. The fact that the title yelled 'read this and you will catch a lunker!' did it for me. This is very much a book about a method, and I won't spoil the suspense, except to say that you will need a Ballydoolagh Bomber and a fast sinking line. 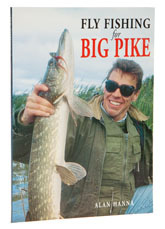 Fortunately, all the instructions you will ever need to tie the fly and gear up to catch a gigantic, reel-emptying, rod-breaking, mother of all pike are squeezed into this slim volume. I dare you to go out and catch one.